Lock in a great price for Albergue Albas – rated 9 by recent guests! It's an open dorm setting for pilgrams walking the Camino. The staff was excellent. Laundry was reasonable and she hung on the line for me. Shower clean with lots of hot water. Bed was comfortable and clean. Very pleased. A little off the Camino but not bad at all. I stopped at a bakery on way out so no problem for food. They had a shared kitchen as well but I didnt use it. It was clean when I looked in. Blanca was very nice. Clean and confortable beds. The location is fairly good. It was clean and the staff were very helpful with directions. Blanca is amazing and helpful, besides, the facilities are way above average for a hostel and the price-value of the place is one of the best I have ever came across. A very calm and inviting atmosphere! Everything was very clean and nice!! Blanca, the person in charge, was cheerful and very helpful. There are a lot of beds, but it does not feel crowded. Everything wad very clean. Quiet, clean and a very helpful and kind staff. We were treated with kindness . This albergue is a little off the Camino, but within walking distance. It's located in a plaza (small business complex area), and there's a nice restaurant nearby, but there are PLENTY of fantastic tapas, bars, and restaurants all within walking distance. It's also less than 1 mile from the train/bus station. 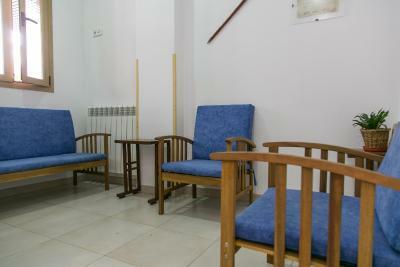 The facilities were clean and well kept, and the staff was incredibly NICE and helpful. She provided maps of the nearby restaurants and information of sites to visit. Would highly recommend this albergue to all travelers, including those who are resting from the Camino! Host is amazing and so friendly!! Private considering the number of beds in the entire room. Small lockers for your belongings. 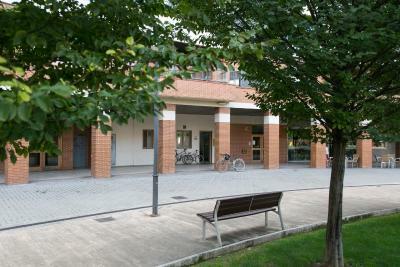 Offering free WiFi, Albergue Peregrinos Albas is a small hostel located in Logroño city center. 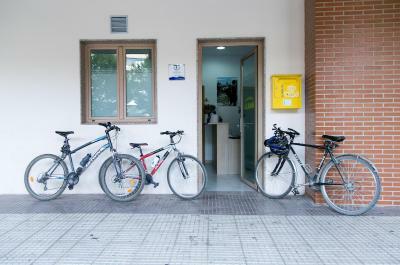 It is set in a pedestrianized square, a 10-minute walk from the cathedral, and offers a free bike garage. The bright spacious dormitory features bunk beds, heating and fans. There are shared bathroom facilities with showers and hairdryers. A microwave, fridge and coffee machine can be found in the shared kitchen area. The hostel also has laundry facilities, including a washing machine, tumble dryer and clothes racks. Logroño Train Station is a 15-minute walk from the property and Calle Laurel, famous for its tapas bars, is the same distance away. When would you like to stay at Albergue Albas? This dormitory room features bunk beds, heating and a fan. There is free WiFi, and access to shared bathroom facilities. House Rules Albergue Albas takes special requests – add in the next step! Please note that stag and hen parties are not permitted at this property. Please note that guests staying in the mixed dormitory room are required to bring their own sleeping bag. Bed linen is available for a surcharge. Please note that children under 12 years old are not accepted. Blanca the receptionist was so helpful and kind. Blanca the maneger and every people who work there is no nice, so friendly and so efficient. The place and area are wonderful also. Nice experience! The whole place was spotlessly clean. There were many beds but it felt private because of the clever layout of the room. Hooks on the end of the beds and very large lockers are always useful yet so many places still don’t have them. They have thought about travellers needs. The receptionist is very friendly. A great experience. I would go again. 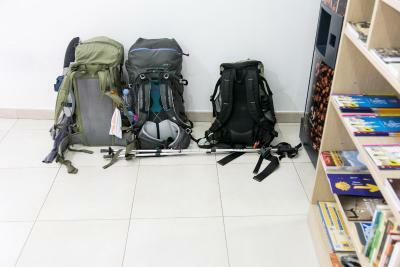 The hostel is very clean and the staff is very friendly. I totally recommend it. Very good service, very clean and organized. The sleeping area was just a big room with a lot of beds in it. Really simple. It is a very good albergue for pilgrims. Doña Alba is extremely helpful and keeps the albergue spotless. The owner is lovely and caring, the location is a nice part of town (walking distance to historic downtown squares), the beds are clean and the bathrooms were impressively spotless. The owner visibly tried her very best to ensure everyone was comfortable and taken care of. Great experience! Not the albergue's fault, but there was a group of people that came to bed after 12 o'clock and made a lot of noise.